Bubble Bashers Bubble Soccer - the most fun you've ever had ! You've probably seen the YouTube videos, Facebook ads or ESPN commercials. Or maybe you've seen us around town. Originating in Europe, Bubble Soccer has found it's way to Arizona. As the original and longest standing bubble soccer provider in Arizona, Bubble Bashers is bringing you this new and exciting sport. Suit up with your friends, family or co-workers and see just how fun this incredible sport is. Bubble Soccer really is as much of a rush as it looks. It's great exercise and safe to play. So give us a call and lets go bash around in a Basher Ball. 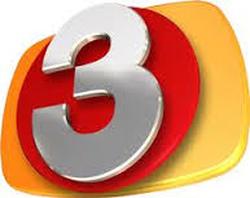 Check out these clips for the great segment 3TV did with us in Gilbert. Ryan O'Donnell is a total pro and was fun to hit around in the Basher Ball. We really appreciate the spot. Contact us today to join in on all the fun!!! Bubble Bashers' Bubble Soccer is the sporting game taking the recreation industry by storm. Once you try it, you’ll be an instant fan! The bubble soccer equipment we use is durable and light-weight, suitable for a number of playing surfaces, from grass to AstroTurf and even the GYM floor. *$50 deposit required to reserve your date.